New gpg-error-config can parse (simpler) *.pc file. It can be used for other software. For the use cases of *-config command, new gpg-error-config can be used, directly, or indirectly. Developers of application can use *.m4 (no use of pkg-config) or PKG_CHECK_MODULES in pkg.m4. 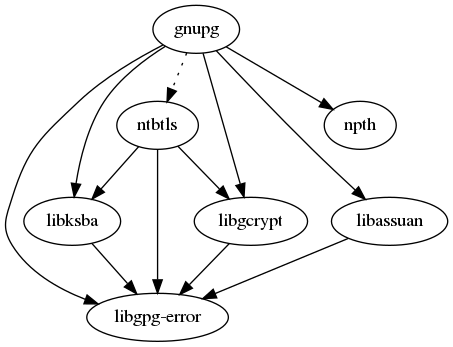 May I suggest to use a (new) gpgrt-config instead of the current name libgpg-error-config. The long term plan is to change the name of the library. OK, I'll change to use gpgrt-config, along with requiring newer version of libgpg-error. Well, I changed my mind. Use of new gpgrt-config requires software update to introduce gpgrt.m4 and update of configure.ac to switch gpgrt from gpg-error, in standard way. That's too much this time. It's good to defer this change. 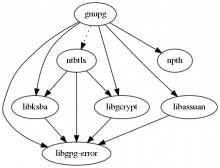 It might be good idea to provide libgcrypt.pc in libgcrypt 1.8.x for forward compatibility with libgpg-error 1.33. A bit tricky, but this would be good to use gpgrt-config by gpg-error.m4. I say "tricky", because its name is gpg-error.m4 but it configure GPGRT_CONFIG to access to GPG_ERROR_CONFIG. @werner , how do you think? New gpg-error.m4 detects gpgrt-config, too. And configure supplies --libdir when it invokes gpgrt-config. For other *.m4 (libassuan, ksba, libgcrypt, ntbtls), it is possible for them to check GPGRT_CONFIG to use gpgrt-config if any. For npth.m4, it can do that too, with no hard dependency to libgpg-error.